[+] Click to enlarge image | Images are for illustration purposes only. 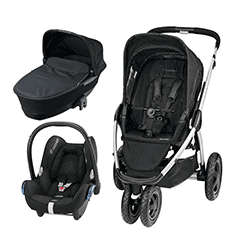 Suitable for the Maxi Cosi Pebble Car Seat! Boori operate a deposit system: At checkout you will be asked to pay a deposit, with the remaining balance to be paid directly to Boori within 2 working days. Boori will contact you for this payment. Your purchase of BOORI product(s) is subject to an agreement between you and BOORI UK LIMITED. Please click here to view the full Boori Terms & Conditions. Find it cheaper & we'll match the price plus 15% of the difference! terms apply Like the reasurrance of buying from one of the largest independent nursery retailers in the country but don't like the idea of paying too much? Not a problem! We work hard every day to bring you the best possible prices. But sometimes, somewhere, someone is selling the item you want for less. Let us help! The Kiddies Kingdom price match applies only to UK internet retailers that have the identical product and/or goods IN STOCK immediately available (not on request) and the product and/or goods is priced accurately. To qualify, we must be satisfied that (a) both products are identical (including colour and specification) and (b) the product you have found is actually available to purchase on the same website. If the price match item is being sold through eBay, the item must be for sale as a 'Buy It Now' and not an auction style listing. Prices are compared on product price and when calculating the competitor's total price comparisons will include the cost of the product plus delivery charges. When requesting a price match you must include the name of the website where the product is cheaper, if possible, a screenshot of the cheaper offer (including the date and time visited), the cost of the cheaper product, your name, email address and contact telephone number along with your Kiddies Kingdom order number. The Kiddies Kingdom price match does not apply when you use coupons/vouchers and/or other promotional offers on the alternative website. The Kiddies Kingdom price match cannot be used in conjunction with coupons/vouchers and/or other ppromotional offers on the Kiddies Kingdom website. The Kiddies Kingdom price match is only available against products and/or goods found within 24 hours of making your purchase on Kiddies Kingdom and any refunds must be made to the card you used to make your original purchase on www.kiddies-kingdom. The Kiddies Kingdom price match does not apply to any Kiddies Kingdom sale or offer items or items available on rental terms. The Kiddies Kingdom price match is subject to change and can be withdrawn at any time and is only available to purchases made in the United Kingdom. The Kiddies Kingdom price match will not apply to items that result in Kiddies Kingdom making a loss to match. Northern Ireland Cost is an average charge applicable to most orders. If the size of the items result in the cost of Northern Ireland shipping going above this charge, we will advise you of the additional cost of shipping & collect further payment before the order is released. Please note if an order has different delivery timescales, the fulfillment time for the order will be the oldest timescale.All orders are consolidated into 1 consignment. The customer may however request for the In Stock items to be sent, by paying a delivery charge to split the delivery. PLEASE NOTE: We cannot guarantee this delivery date, as this is a date given to us by our suppliers. Although this date is a strong indication of its expected time, it can be changed at any point. Delays can be reported to us at any point until the pre order date specified. If there is any change to this date, you will be notified by our team. For accuracy of information we suggest you call us closer to the date specified so we can get an accurate update from our suppliers. BAND E Pre Order (To Be Confirmed) Items are not in stock with us or the supplier, and there is not confirmed date for when the supplier will receive stock. Orders placed for this item will reserve the item for when the date for stock arrival become available. Please fully inspect all items recevied and report all Faults and Package/Product Damages within 48-72hours of receiving the items. This will allow us to contact the relevant department and resolve all issues more effectivly.